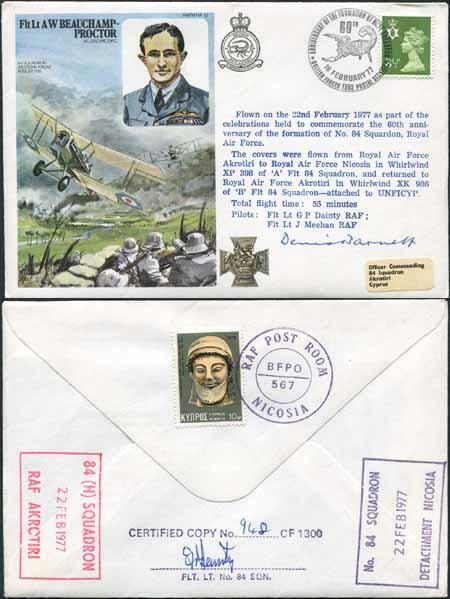 16 Feb 77 BFPS 1553 60th Anniversary of the Formation of No 84 Squadron Flt Lt A W Beauchamp Proctor VC . Cover depicts Flt Lt A W Beauchamp Proctor attacking German troops 84 Sqn West Front August 1918 at the Victoria Cross . Flown in Whirling Helicopter from RAF Akrotiri to RAF Nicosia. Personally Signed by Air Chief Marshal Sir Denis Barnett. A New Zealander he joined the RAFO whilst at Cambridge being awarded a permanent commission in the RAF on completion of his degree. In 1935 he was sent to the USA to study instructional methods used by the American services. In late 1939 he was a member of a mission sent to Italy to investigate the purchase of Italian aircraft for the RAF. As AOC No 205 Group the task fell to him of supervising the move of the RAF from Egypt to its new bases in Cyprus and remained in Egypt whilst the AOC in C established the new HQ in Cyprus eventually moving to the new HQ himself in October 1955. However his tour in the Mediterranean ended in 1956 and he returned to the Britain to command the RAF Staff College. 1956 saw the gradual increase in tension between Britain. France and Egypt following the latters nationalization of the Suez Canal. When this tension escalated to the point of armed conflict he found himself appointed to command of the air task force to be involved in the Suez campaign Operation Musketeer. His immediate staff was selected from officers then attending the Imperial Defence College where much of the early planning for this operation took place. His selection and the appointment of a planning staff divorced from the existing Middle East command structure whilst not a popular move with the resident Middle Eastern commanders (ACM Sir Hubert Patch and AVM W J Crisham) was logical in that Denis Barnett had more recent experience of operations and the situation in Egypt than any other serving Air Officer. The air task force was allocated he role of bombing the Egyptian airfields in order to achieve the required air superiority. He ordered operations to commence at 16:15 hours on 31 Oct 1956 and by 2 November he considered the Egyptian Air Force to have been eliminated as an effective fighting force a view which was later confirmed by the Bomber Command Operational Research Branch. From 1965 he was the Member for Weapons Research and Development on the Atomic Energy Authority a post he held until 1972. Details and black and white photo enclosed. Certified Copy No of 1300.